Ynes Vasquez, a resident of the Alanna Heights subdivision just north of Poteet, moved to the area thinking it would be the perfect place to retire. He never dreamed that he and his wife would have to battle dust clouds, loud noises and bright lights at night from a frac sand mine so close to their backyard. The mine operates under Stillman Enterprises, but the property is owned by 16 Sands LLC. 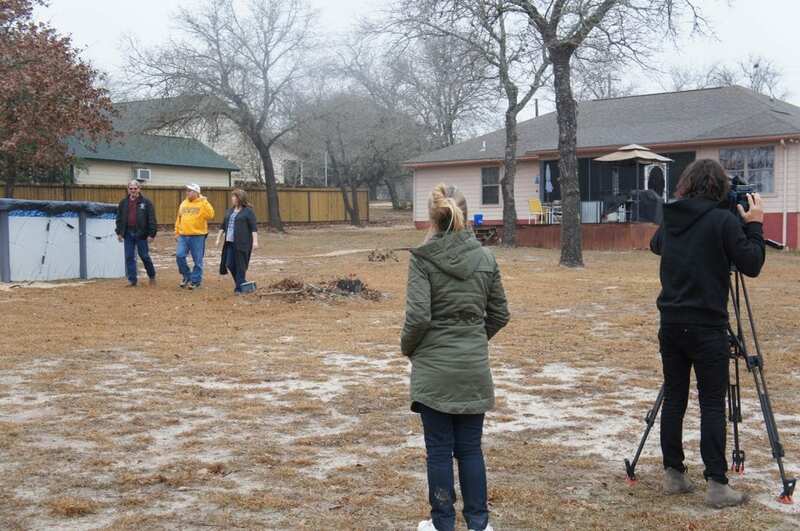 France 2 TV correspondent Agnes Vahramian speaks to homeowner Ynes Vasquez from a deck in his backyard, with the Stillman frac sand mine in the background. Vasquez was among those Atascosa County residents interviewed for an upcoming documentary on sand mines throughout Texas. A news team from France 2 TV channel, headquartered in Washington, D.C. filmed in the area on Friday, Jan. 19. France 2 correspondent Agnes Vahramian spoke to Vasquez, who was joined by Not Just Dust members Jessica Hardy and Russell Wilson. 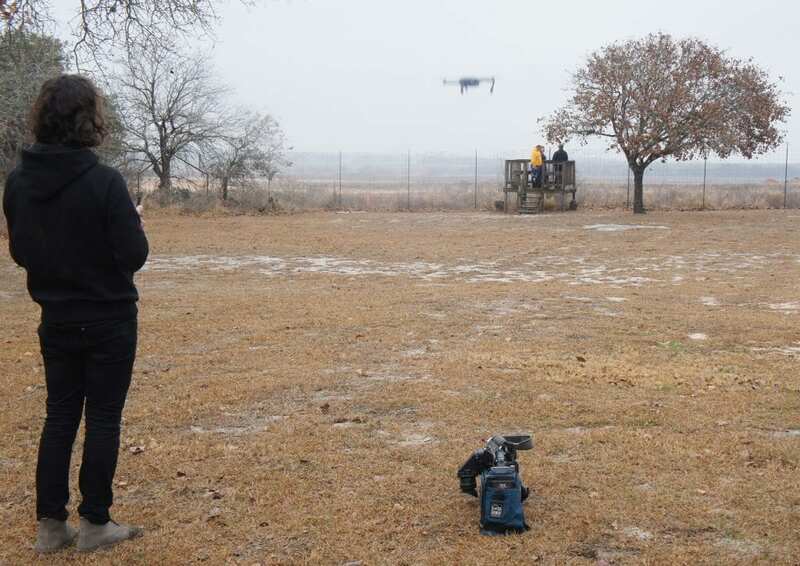 The day before arriving in Atascosa County, the TV crew filmed in Midland. Vahramian spoke on how one must weigh the good and the bad sides of the industry. On one hand, while it brings jobs, the full consequences may not be known for years to come. Many times during the day it is quiet, said Mr. and Mrs. Vasquez, however at 5:30 or 6:30 p.m. is when the mine starts up. Alanna Heights resident Ynes Vasquez speaks to France 2 TV correspondent Agnes Vahramian. He explained that he feels really sorry for his neighbors. Vasquez has two new neighbors who just built brand new houses, and they are already talking about selling. Mr. and Mrs. Vasquez are now talking about selling their house and leaving the area, as they do not know how long the sand mine will be in operation. Much of the filming took place from a deck in the Vasquez’s backyard overlooking the Stillman frac sand mine. “Now you see there are pits in there. What are the pits for? Are they going to hold water? Are they going to process the sand? What are they going to do with the run-off? Do they realize they are right over an aquifer?” asked Vasquez. Although there were not any dust clouds on this particular part of the day during filming, Vasquez explained that when the winds are coming from the south and moving to the east, that is when they get lots of it. “He does whatever he wants down there. I think at one time they were talking about how he had started the plant without permission, he did not have the permits because he was running off a different plant. Then it stopped for a little while and then I guess he got his permits, and it started again,” Vasquez said. He pointed out berms that were placed to keep the dust and noise from residents in the subdivision, but said it is not working. One of his neighbors is less than 100 feet from the roadway. Vahramian asked if he thought the dust was dangerous. “Yeah, that is nasty stuff. Who wants to have to wear a respirator just to mow your lawn, or to come out and work in your yard or be outside? This is an area where, when I first moved here, it was beautiful. You could see forever, never see anything. Now this is all you get,” Vasquez responded. Vasquez said he will lose the value of his house. Last year he protested his taxes being raised, because of the sand mine behind him, and they laughed at him. His biggest complaint is that the company does not operate during the day, but runs all night long. Vahramian asked Hardy what she could do for Vasquez. She answered unfortunately not much, unless they can get some legislation on this. “We have tried working with the sand mine owner and as of yet, he hasn’t taken a meeting with us. One time they sent a representative and that guy did not even know what an aquifer was, so we didn’t get too far there,” said Hardy. Vahramian asked them if when they see the fracking boom, do they also see the sand mine industry all over Texas expanding. Hardy said that yes, she thinks as the industry picks up the frac sand mine goes with it- it goes hand in hand. Vasquez agreed. “The plant up north about three miles from here (Preferrred Sands), they have done everything the right way. They widened the area so trucks can get in and out. They even invited people from the neighborhoods to go down there and see their operation. Do you think this guy has? He does everything underhandedly, I think, under the table,” Vasquez said. The group also discussed what they know about the consequences of this type of business, especially regarding the effects of dust on health. Vahramian pointed out how it is a relatively new industry. Hardy said they don’t really know yet. She and the Not Just Dust group advise those living by such facilities to get a full health screening and X-ray, as they are the guinea pigs. “We are the ones that 20 years from now, they will have to check our lungs to see what it did,” Hardy said. Wilson said that he does know that in the construction industry he is in, that OSHA (Occupational Safety and Health Administration) has just implemented more stringent requirements for exposure to silica dust. The news team films Russell Wilson, Ynes Vasquez and Jessica Hardy at Vasquez’s home. Hardy pointed out a playground nearby to Vasquez’s house and how the children are taught that if they see a big cloud of dust, they need to go inside. Vasquez asked why, with all the land there is in Texas, did the mine have to build in a residential neighborhood? “To what extent would you say, is it a price to pay for jobs, the economy, growth and wealth?” asked the photojournalist. “Yeah, that is what they are going to say, but it’s like… is my life worth these guys being in business and making the big bucks? Am I going to have to sacrifice my house, my retirement home,” Vasquez said. The view from Broken Star Trail in the Alanna Heights subdivision, just north of Poteet. He used to admire the beauty and scenery and as an aviation fan, he loves watching planes fly over. Now, he sits inside because of the sand. Vasquez has seen the sand storms of the Middle East, which is what he sees in his backyard. The lights at night shine into their bedrooms like a football field. The group continued sharing their discussions on the deck. The news crew also flew a drone above. After the crew headed back for their flight, some of the neighbors gathered with Mr. and Mrs. Vasquez, Wilson and Hardy in the kitchen to share some cake, as well as sharing their frustrations and the battle they have endured. 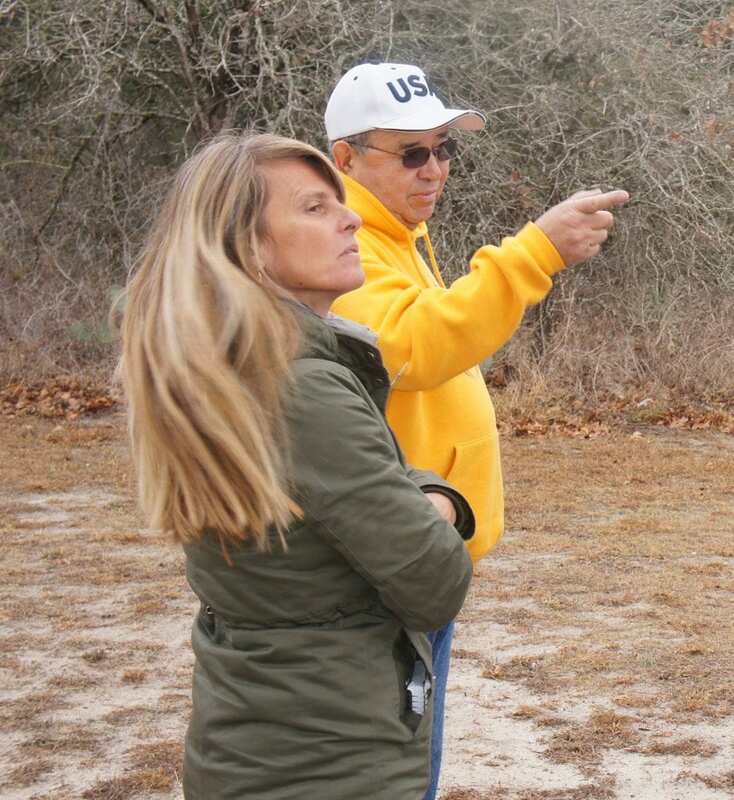 Wilson and Hardy also spoke on forming Not Just Dust in December of 2016, the concerned citizen’s group that began when residents learned a frac sand mine was planning to build its site on Old Applewhite Road and Bruce Road. After extensive research, time, meetings and negotiations throughout 2017, Preferred Sands and Not Just Dust came to an agreement. 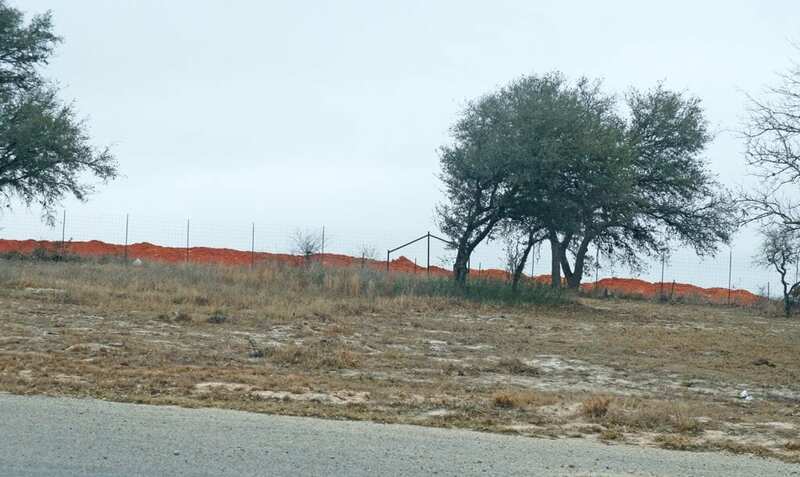 The company decided to relocate the plant to the same property where Martin Marietta operates and also agreed on a list of other items, such as exiting traffic onto Highway 16. 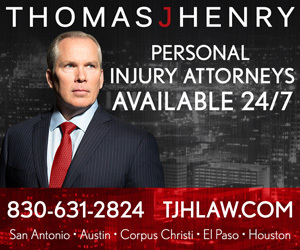 The organization is now sought after by others across the country needing assistance in similar situations. France 2 TV has an audience of approximately 5 million every day in France. They also have an additional audience in other French-speaking countries and will notify the Express when their program airs. thank you for the story on sand mining. any expository measures are a welcomed relief to those being affected by this nuisance including myself. Capitol aggregates is now my neighbor with no buffer zone to speak of. the mining has affected all my family and especially my grand kids who are already asthmatic. I built here in poteet 12 years ago on a beautiful piece of property that I can o no longer enjoy. I hate being forced to move because of the conditions that have invaded my pursuit of happiness in the name of profit.